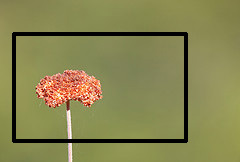 When you minimize cropping, you maximize the area of your subject in the frame. That means you’re dedicating as many pixels as possible to your subject. And, the more pixels you dedicate to your subject, the sharper it will be. You’ve probably noticed this when you try to photograph something really far away (like a flying bird), and since it’s so far away it only takes up a tiny amount of the frame. And, then when you crop it, it looks really unsharp. When you crop your photos, you obviously take out a lot of the pixels, so this also reduces the maximum print size. This may not be a big deal for all types of photographs (such as close-ups, where you don’t always want super large prints). But, it’s extremely important for landscape images (which are normally printed in large sizes). In close-up photography, you often want to isolate your subject against an out-of-focus background. This helps draw the viewer’s eye to your subject. If you avoid relying on the crop tool in post processing, then this forces you to get closer to your subject in order to fill the frame with your intended composition. And, remember that as you move your camera closer to your subject, depth of field decreases (giving you a more out of focus background). I do think there are some situations where it’s perfectly fine to rely on the crop tool, especially when you can’t even fill the frame with your subject anyway (which is often the case with any kind of wildlife photography). But, when possible, get your composition correct in the field. Take the time to really think about how you want that final image to look. Great article Steve. I try to use cropping to a minimum, however when I use focus stacking it is usually the norm. Something always moves and the final image always needs a trim. Great article and I understand your points, but as some one who is extremely short-sighted with astigmatism, it is very hard to ‘see’ and get that great balanced composition without editing. As a beginner (15 mths with a DSLR), I have relied heavily on cropping to create a better balanced composition (when I download the day’s images onto my computer). It’s actually not until I download the photos onto my computer that I REALLY see what I’ve photographed that day. The cropping may only be a quarter of an inch off one side OR varying amounts off all sides. I AM improving though. In the last few months I have managed to ‘see’ a bit better through the camera viewfinder. guess roughly what I might end up with and not crop so much in post processing. Today I was quite pleased to get a few photos which didn’t need editing at all. But it’s taken over 50,000 photos and a lot of practise to get to this stage. I envy those photographers with perfect (or pretty good) eyesight. Good points, but sometimes with wildflowers (and wildlife) we need more depth of field to capture all in the detail in the subject, which is more easily accomplished by backing away a bit, and then cropping the final image. With today’s camera’s you can often crop 50% and still get a sharp enough photo for an 8×10 print. Keep up the good work – always enjoy your posts. This assumes you either never print or you always print using the same aspect ratio as your camera. If you print 8×10, 11×14, 11×17, 4×6, etc. then you need to leave the necessary space for cropping to other aspect ratios than your camera. Good ideas, Steve. Even for those of us who should know better, it’s easy to let cropping be a crutch. Good reminders! I really hate to crop but sometimes have to with birds in flight. It’s real tricky to get a great composition while panning fast moving birds. Steve, I really enjoy your posts, they are very helpful and I love the way you deal with one point at a time. I am considering buying a camera to photograph birds in flight . I take photographs whilst walking my dog therefore need a camera that I can operate easily as I am holding a lead. I miss so many good photo opportunities because i require a fast shutter lens and a good non shake zoom. I have read hundreds of reviews and am now thoroughly confused. Could anybody suggest a camera for me that won’t break the bank. If you really want to take decent photos of birds in flight, you’re going to need to put down the dog lead. Also, the things you’re asking for are expensive. Add to this, a long lens (if you want to get close), let’s just say a 300mm and you’re already talking decent money. What is the technical solution to the loss of sharpness due to cropping when it is absolutely unavoidable? Can any one enlighten me? This is very enlightening,,,,i really need to concentrate on framing my shots more from the get go,,,thx for this article! Hi Jennifer, fastening the lead to a waist belt will free your hands to take the pictures you desire. Benn is right in recommending 300mm-minimum required. I have a 100-400mm (very heavy to carry around) but often it can’t fill the frame. Hi Roy, I too will be very careful shooting to avoid need for cropping later, of course one can only try but not entirely n always avoid.